THE MARTINI CHRONICLES: A Thanksgiving Martini....Courtesy of the Martini Chronicles! A Thanksgiving Martini....Courtesy of the Martini Chronicles! I know I said I wouldn't be back until December (next week! ), but I have received so many requests for a martini recipe perfect for Thanksgiving. Well, it turns out that I posted my favorite, Thanksgiving-appropriate martini recipe a couple of years ago right here on the Chronicles! Those of you who are new to my little blog, however, may have missed it. Never fret! I'm here to post it again! 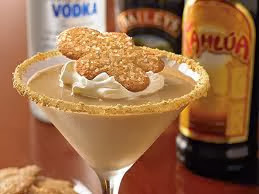 I found this Gingerbread Martini recipe at the Outback Steakhouse in San Juan, Puerto Rico (I’m sure they serve it in all the locations!). Outback’s Gingerbread Martini was so amazing that I had to share it with my readers. Since that time, it has been a Chronicle favorite. In honor of Thanksgiving 2013, I present to some, and introduce to others, the Gingerbread Martini! 1. Rim a chilled martini glass with crushed graham crackers. 2. In a shaker, combine Vodka, Bailey’s, Kahlua, Monin, and Ice. Shake! 3. Strain mixture into prepared martini glass. 4. Garnish with whipped cream and a gingerbread cookie. Have a wonderful Thanksgiving! Remember to be thankful for all of your blessings. There are so many people in the world who are not as fortunate. Say a special prayer for them at the dinner table today.